'Tis the time for a supine, and warming, fragrance to wear as I dream of milder weather and start the list of plants I'll grow next year. Diptyque Eau Lente is a perfect perfume to enjoy as I peruse fat and heavy garden design books and seed catalogs, and re-read my favorite books that celebrate summer. The comforting (plush and sweet) scent of opopanax opens Eau Lente: vanillic, musky, resin-y with hints of myrrh. Opopanax (in any quantity) is rare in today's fragrances, perhaps due to current perfume styles and trends or as a result of IFRA restrictions. (I didn't know I needed opopanax toothpaste till I read about IFRA regulations on ingestion of opopanax.) Still, the dose of opopanax in Eau Lente is satisfactory. Opopanax is one of my favorite fragrance ingredients: in winter it reminds me of summer and in summer it reminds me of winter (the part where you're in a cozy room, relaxing by a fireplace that's full of burning, snapping logs). As Eau Lente goes into its mid-development, woody cinnamon and zingy ginger join the opopanax. For a short while, the scent of Eau Lente reminded me of an old-fashioned gingerbread, sticky with treacle and FULL of hot ginger powder. Eau Lente's extreme dry down adds some muskiness to the remaining opopanax. As I wear Eau Lente, a lovely warmth and calm envelops me; and I can use all the calm I can muster these days. 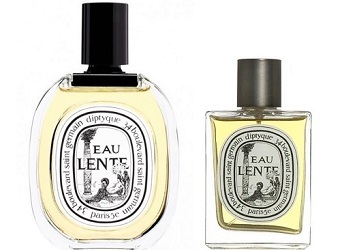 My first bottle of Eau Lente was in Diptyque's original square-ish bottle and it was denser/thicker in character than today's sheerer version. But, "new" Eau Lente smells like "old" Eau Lente — at a lower wattage. If you never got the chance to smell original Eau Lente but did wear the gorgeous Comptoir Sud Pacifique Opoponax, you'll know what you're missing. 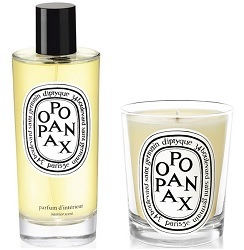 Another way to experience opopanax is with Diptyque's Opopanax candle and room spray; they're great. Each has the beautiful, resinous, "antique" scent of silky soft opopanax at (it seems) higher concentration than Eau Lente. Opopanax fans: please comment and share your favorite opopanax-rich perfumes. Diptyque Eau Lente Eau de Toilette is $130 for 100 ml; the Opopanax candle is $64 and the Opopanax room spray (another boutique exclusive) is €48 for 150 ml. For buying information, see the listing for Diptyque under Perfume Houses. Lovely review. I never tried Eau Lente and I feel I’d like to give it a shot. My favorite opoponax centered fragrances was Prada No. 8 Opoponax, from the very first boutique collection they had. All of these fragrances were quite under the radar for most. When I asked about them in Milan a saleswoman had to fetch them from the backroom because they were long gone from display, as she explained. lucasai: too, bad…I certainly never came across them anywhere. I adore opoponax in its undiluted form…I bought a bottle from a perfumer in its essential oil version and when diluted in a carrier oil or with bourbon vanilla essential oil was a perfume unto itself. Eau de Lente sounds glorious! Thank you for this review! ChocoMarzipan: I hope Eau Lente is as successful for you as Sables! My apologies for going OT, but which of your gardening books do you re-read? Ann Lovejoy is one of my favorites; I re-read hers almost yearly. Scentalicious: I’m going to do a post on those books and how they relate to perfumes I love…soon! Such a nice review, Kevin. You make this perfume sound lovely. lillyjo: thanks! It’s a fave of mine from the older Diptyques…never tire of it. a lovely review, thank you! I have sort if given up on Diptyque but you review has renewed my interest. You had me at spices and gingerbread, not to mention opopanax and myrrh. Thanks Kevin! I forgot to add, lovely photos. I thought the were shots of paintings until I read your review. Thanks, Petunia! For me, the oldest of the Diptyques are the very best (in case you have not sampled them). recently, I DID fall under the spell of the Eau de Parfum version of Vetyverio, too. Thanks! I’ll give them both a try. Agree, I love the oldest best. Of course, they do require the right mood and weather, so I’m grateful that you’ve reminded me that November is the time for Eau Lente. TBH, I wear the florals, Olene and L’Ombre dans L’Eau more often that the spicy ones. In terms of related fragrances, what about some of the April Aromatics? I’m not sure which note is opponax, but some of them like Nectar of Love and Tempted Muse are wonderfully resinous. Noz: I think Calling All Angels had opopanax in it…I’ll have to look through my samples. noz: I’ve been drenching myself in L’Eau Trois recently, too…deliciously dry dry dry. Yikes. You reminded me that there IS a Diptyque boutique in SF (forgot about it because it moved). Guess it goes on the to-do list . . . .
SFGuy…beware! I sort of went into “this isn’t REAL money I’m spending because I’m out of town” mode. Great staff there too. Dropped in yesterday, sniffed around and bought a candle. Got it home and read the warning label: “Toxic to aquatic life with long lasting effects.” That sure took the joy out of the experience. You’re right about the staff though. SF, that happened to me with an Annick Goutal roomspray. Dare we read any perfume label…iso e super is probably the culprit? One of my favorite Diptyque fragrances. But I admit I do not really know how opoponax smells. For me, Eau Lente is a clove scent. Glannys: On my skin, I don’t detect much clove in Eau Lente; the clove monster for me in the Diptyque line is L’Eau (potpourri with clove/cinnamon for DAYS). I think that was my first Diptyque cologne purchase. Hi Kevin, You are so right that L’Eau is a power bomb! I am a female and I am trying to find another juice to pair with L’Eau to make it softer and feminine. Do you have any suggestions? Zhu: maybe a strong, straight-up rose? I’m thinking Une Rose by Frederic Malle might work…. Thanks Kevin! 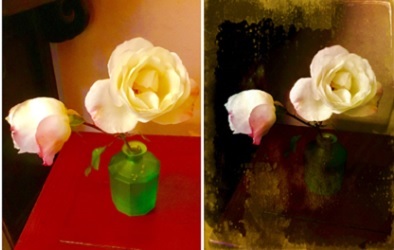 Don’t have Une Rose but I can certainly try Velvet Rose & Oud, Red Roses, or Tea Rose…. So great to see this review! This is one of my favorite perfumes, but many of my perfumista friends think I’m crazy when I list it in my top 20 or whatever. Anyway, I also find it very comforting (the opoponax) while at the same time very uplifting (the spices). So I find it wonderful on overcast days, even in summer (we get cold foggy summer mornings where I live). In general I’m kind of obsessed with spicy scents. I have the the original square bottle. It’s pretty strong and a bit brash, though I love it. I’ve been afraid to try the newer version (plus I hate the look of the new bottle), though I guess I should next time I get a chance. SI: do try the new version…it won’t be as strong, but you won’t burst into tears. HA! I really really *tried* to love this, but I think opoponax is a note I struggle with. It has a scratchy powdery aura to it that I found annoying. Now L’Eau and Eau Lente – those I luuuurve. Mike: this is Eau Lente…which other did you love, Trois? I think of Eau Lente as a more rustic Shalimar. I absolutely adore the Opopanax candle, so I’m sure I will look ve Eau Lente as well..
I’m still not a fan of the (not so new anymore) bottle design. LC: indeed…how many John Galliano roomsprays and candles have I bought? The list of purchases is huge. I guess I’m used to the “new” bottles…but still miss the old ones. I know it’s expensive but it would have been nice to keep the “foundation” perfumes in the old bottle design. I love the candle. My husband loves opoponax on me, especially Les Nereides Imperial Opoponax. CAZAUBON: I’ll have to look for that one.